So I know I'm late to jump on the Decomesh bandwagon but I got a front row ticket for it this year. In my defense, I fell in love with the stuff last year but didn't know what it was called or where to find it. I searched and searched, and read blog after blog, but it wasn't until Pinterest that I learned what the stuff was called, where I could buy it, and how to make things with it. 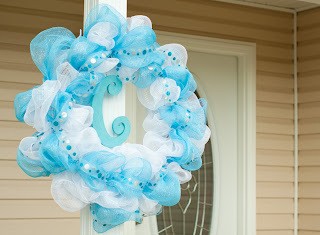 The first two things I made with it were wreaths for my sister and me to hang after we had our babies. Then Christmas came and I couldn't find the colors I wanted at Hobby Lobby. 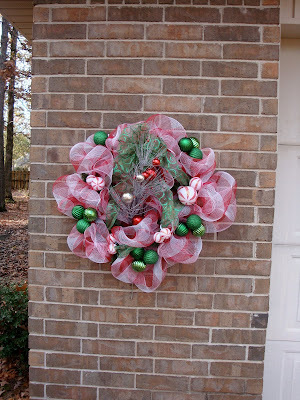 Resigned to order from some place online and pay astronomical shipping fees I geared up for what I wanted to do and pinned wreaths, garlands, and bows so I could deco-mesh-arate. As fate would have it I happened to be at Hobby Lobby one night when they were restocking the mesh. I fell on top of those boxes like a fat kid into a chocolate river. And then I went to town creating a number of masterpieces. 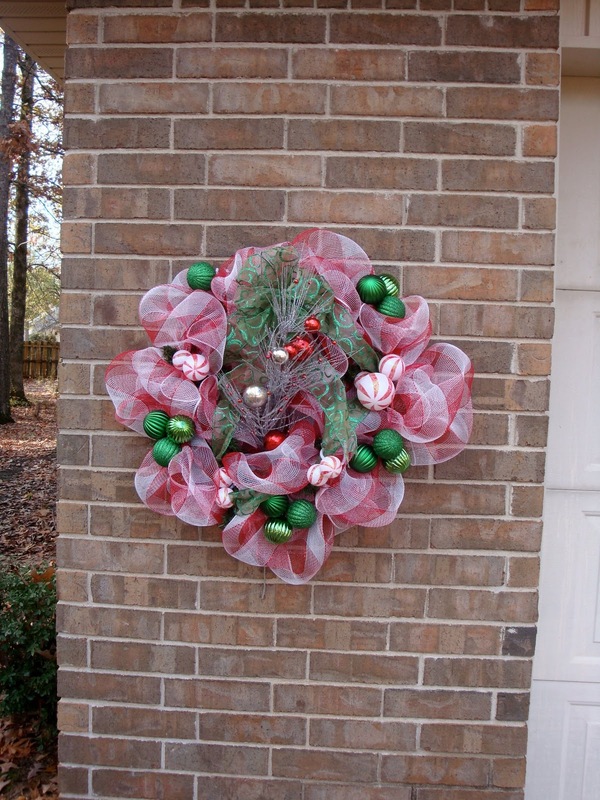 First, my mom wanted matching wreaths to hang on either side of her garage. I can't take complete credit for these. I only did the mesh. Mom went and added the ornaments and the sparkly pick on her own. I already know for next year we need to change the ribbon since you can't see it. While I was lucky enough to get mesh at Hob Lob in Memphis, the ribbon was already over picked and there weren't very good choices for what I wanted to accomplish. 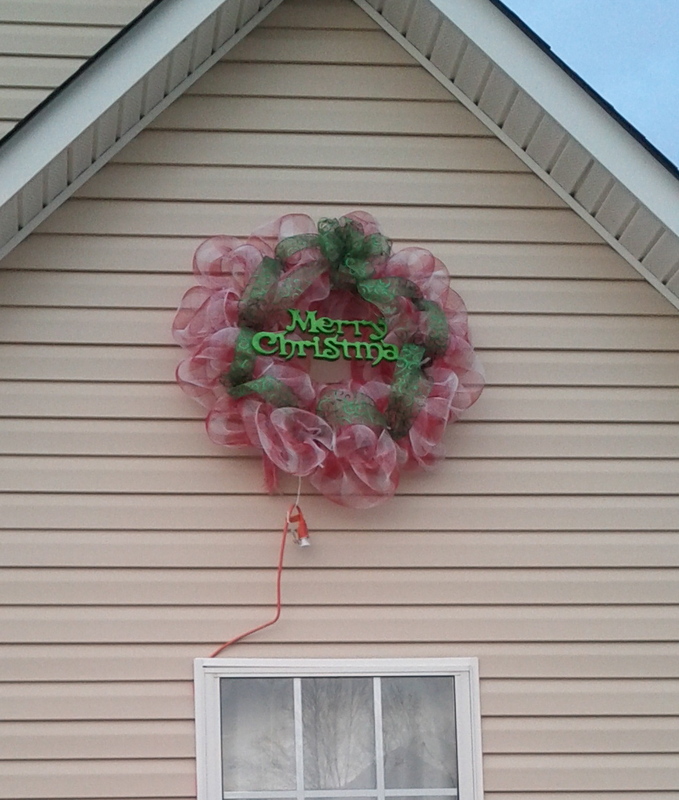 Then, while we were in Mason for Thanksgiving, my sister-in-law asked me to make her a wreath. We went to pick out the stuff and I was in Hobby Lobby heaven! First because their Hob Lob was huge! And second, because mesh must not be popular yet because they had plenty and tons of cute ribbon and other accessories. Here is the one I made for her. I think it was probably my favorite. Then we came home and I was able to make a few things for my house. I made a bow for the mail box. 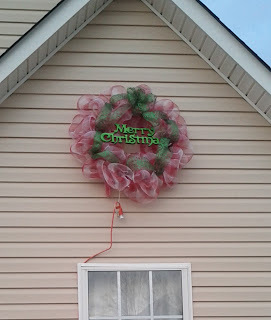 And a big wreath that lights up at night for above the front bedroom window. 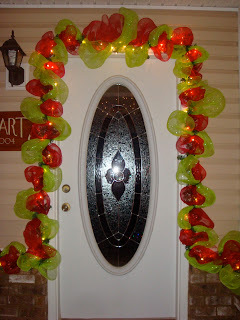 But the favorite thing I made for my house was garland for around the front door. This year was step one for the garland, just the mesh and lights. Next year I plan to add bobbles like big ornaments and a matching wreath for the door maybe. I actually planned on making the matching red and green wreath this year, but ran out of mesh and Hob Lob was absolutely sold out. One of the ladies I asked said the warehouse was out of it so they wouldn't get anymore in. I also made one other red/white plaid wreath for a friend. But I failed to take a picture before I gave it away. Hopefully I can get them to snap a shot and send it to me so I can share it here. 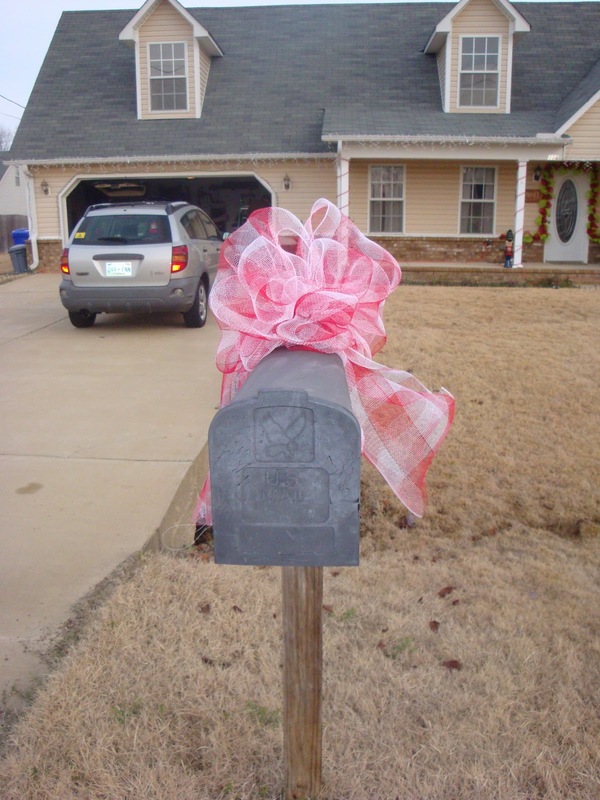 I love decorating for Christmas! Don't you? Found it! LOVE the lighted garland. 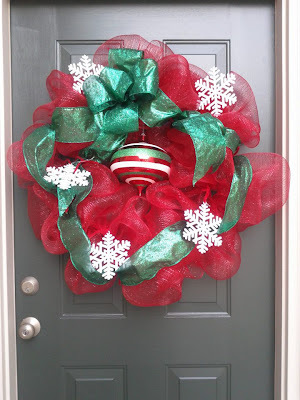 Now I have to make one of these for my front door this year.